See or read three full-length plays. * Write a review of each. Discuss with your counselor the plot or story. If you chose to watch the plays, comment on the acting and the staging. Write a one-act play that will take at least eight minutes to perform. The play must have a main character, conflict, and a climax. Act a major part in a full-length play; or, act a part in three one-act plays. Direct a play. Cast, rehearse, and stage it. The play must be at least 10 minutes long. Design the set for a play or a theatrical production. Make a model of it. Design the costumes for five characters in a theatrical production set in a historical time. Show skill in hair and makeup design. Make up yourself or a friend as a historical figure, a clown, an extraterrestrial, or a monster as directed. With your counselor’s approval, help with the building and painting of the scenery for a theatrical production. With your counselor’s approval, design the lighting for a play; or help install, focus, color, program, and operate the lighting for a theatrical production. 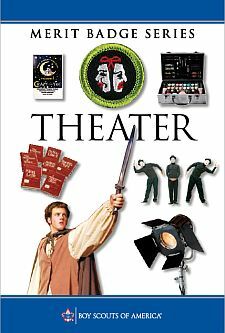 With your counselor’s approval, help install, focus, equalize, program, and operate the sound for a theatrical production. Serve as the stage manager for a theatrical production. Document all cues and stage setups in your calling script. Mime or pantomime any ONE of the following chosen by your counselor. You have come into a large room. It is full of pictures, furniture, other things of interest. As you are getting on as bus, your books fall into a puddle. By the time you pick them up, the bus has driven off. You have failed a school test. You are talking with your teacher who does not buy your story. You are at a camp with a new Scout. You try to help them pass a cooking test. The Scout learns very slowly. You are at a banquet. The meat is good. You don't like the vegetable. The dessert is ice cream. You are a circus performer such as a juggler, high-wire artist, or lion tamer doing a routine. Explain the following: proscenium arch, central or arena staging, center stage, stage right, stage left, downstage, upstage, stage crew, flies, portal, cyclorama, stage brace, spotlight, floodlight, lighting control board, sound mixing desk. *Watching plays on television, video, or as a movie is not permitted.